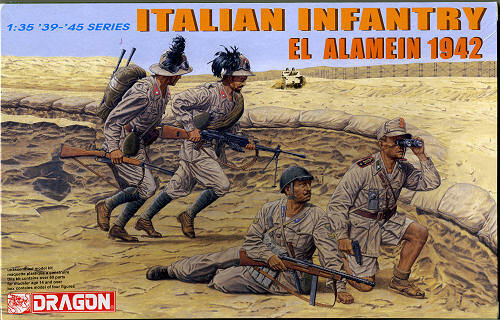 Something one rarely sees in mass marketed kits are WWII Italian soldiers. This set helps to take care of that situation with a very nice group of figures as in the 1942 time period. 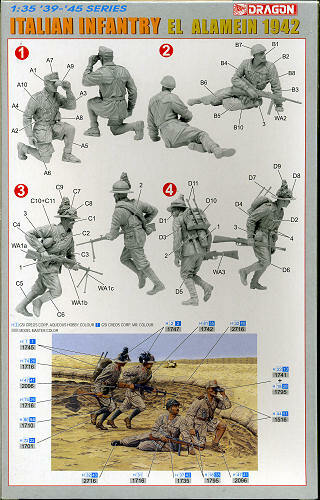 I know nearly zilch about Italian units and weapons, but this set provides several alternate uniforms and weapons. There are four figures in the box, an officer in shorts, with sandals, a field cap and holding a pistol. Another soldier with what looks to be a carbine of some sort with a large clip and wearing a steel helmet. The other two figures make up a light machine gun team. Both of these figures seem to be wearing pith helmets with a group of feathers in the brim. One figure is carrying the gun with the bipod extended, while the other is carrying a rifle and spare barrels. It is nice to see Dragon branching out to include the soldiers of other than the 'Big Four' when it comes to fighting in the west. Perhaps they will start doing more in this line. My thanks to www.dragonmodelsusa.com for the preview set. You can get this today at your local shop or from the hyperlink.